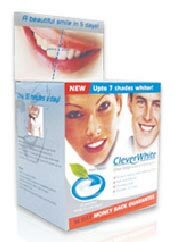 CleverWhite, the easiest and only on-step system for a home teeth whitening. CleverWhite gives a professional application and look without the cost and time of visiting the dentist. CleverWhite is already a leading teeth whitening kit on the international market and has been introduced to 35 countries. Since its introduction in Europe, it has fast established itself as a leading brand in teeth whitening and has overtaken existing, well-established brands in some markets. Its formulation is gentle and designed to provide maximum tooth whitening results with a minimum of sensitivity to surrounding soft tissue. When the instructions are followed properly, customers can obtain whitening results after completing a 5 day treatment. It is fast, whitening teeth in only 5 days making it the fastes system currently available. It is easy to wear and to use: the one-size-all foam trays ares soft and flexible. There is no mixing involved, each tray is prefilled with just the right amount of whitening gel, which is formulated specifically to prevent sensitivity. The tray is designed to whiten both the front and the back of the teeth, which is important because teeth are translucent and stains on the back can show through the front. CleverWhite's propriety formulation accomplishes successful whitening results by suspending the active ingredient in a glycerin based gel that maintains a neutral ph balance. The vicosity of the formulation is sufficient to maintain its form delivered in a Styrofoam tray shaped to fit a dental arch, ensuring that only the 'smile zone' is whitened and not the entire teeth. These trays are pre-filled with the formulated gel and hygienically sealed in a mylar pouch. The CleverWhite kit is designed for a five-day treatment plan and is delivered with 10 pre-filled trays to accomplish treatment by using a pre-filled tray on each (upper and lower) arch daily for 30 minutes. "I've tried the $450 dentist prescribed take-home kits before. Although they whitened my teeth to my satisfaction, I found them cumbersome to use and didn't use it as often as I should have. I love CleverWhite though, more effective, cheaper than the dentist's kit and so simple to use. I can use it doing housework or reading a magazine and dispose it after half-an-hour of use. "I'm amazed at the easy application and exceptional results - stunning, radiant, bright white results instead of stained teeth. Incredibly affordable and safe." "Wow A product that 'really' works. One I will never be without. I have another kit already in the fridge ready to use when necessary. Fabulous! " "Years of tea and coffee drinking, and smoking have stained my teeth. I have tried many products inthe market but none worked for me. After completing CleverWhite's 5-day whitening programme, even my kids noticed the results! Now my wife is determined to try CleverWhite to be in time for New Year." Please also read about the B'Dazzled teeth whitening kits.